Prince Albert’s interim police chief is encouraging residents to take a few extra precautions to combat an increase in vehicle thefts. Through February, Prince Albert is on pace for even more thefts in 2018 than the roughly 370 that occurred in the city last year. Acting chief Jeff Rowden said it’s a baffling development for the city, considering how many police services across the province have run awareness campaigns. “It’s something that’s easily achieved because if the car is running with the doors unlocked, somebody jumps in and within seconds it can be gone,” he said. According to the Prince Albert Police Service year-end crime statistics, there were 326 reports of stolen vehicles in 2016. That number jumped to 372 in 2017. In January 2018 there were 42 vehicles reported stolen in Prince Albert, well above the 25 thefts in January 2017. The thefts are bad enough, but the problem often compounds itself further since stolen vehicles are often used in other crimes. Rowden added that stolen vehicles aren’t just a Prince Albert problem. According to SGI, vehicle thefts in Saskatchewan surged from 3,034 in 2015 to 3,819 in 2016. The number dropped off slightly in 2017, when 3,735 vehicle theft claims within the province were filed, however, the problem is still a long way from being solved. Although Rowden has concerns about vehicle theft in Prince Albert, he’s optimistic things are going to improve. 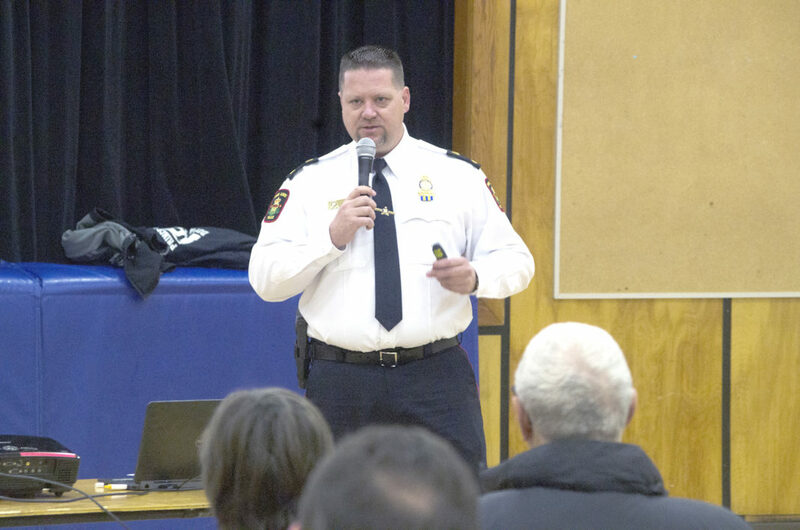 He’s attended the last two neighbourhood meetings to let people know about the problem, and plans to bring the same presentation to the next two on March 20 and 21. Rowden said that they’ve tried to be more visible in the community following feedback from neighbourhood meetings in 2017. However, when it comes to comes to vehicles, it’s easier to stop thefts before they start rather than chase the thieves down afterwards.